Here in England and in other countries at this time of year, we wear poppies to show we have not forgotten those who gave their lives in World War 1 and in all other wars. Poppy seeds remain in the ground dormant for many years until they are disturbed and this happened on the battle fields of France and Belgium. Several years ago while on holiday in France I visited some of the war graves with my family. The impact of seeing all those lines of white crosses can never be forgotten. When I created this special collection of poppies I added the simple white scallops and crosses along with ears of wheat. I had created two sets of these designs for 4″ by 4″ and 5″ by 7″ hoops. Now seems a very poignant time to finish the collection off with a final set for larger hoops. This new set of designs will be released next week along with some applique poppies to add to your embroidery or to make your own poppy to wear with pride. You can preview and pre order them now if you join my Embroidery group. Graceful Embroidery will be making a donation to the British Legion later this year as a result of sales from this collection of designs. 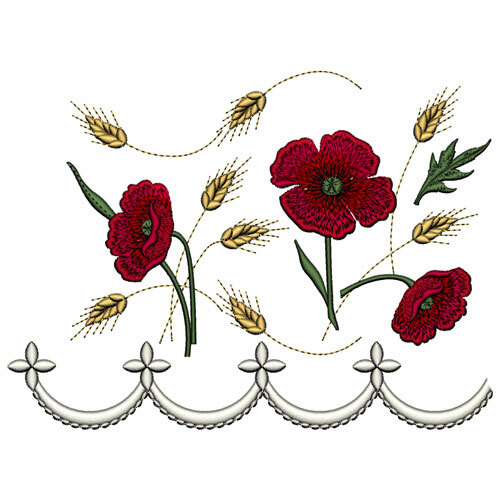 See existing designs of Fields of Poppies at Graceful Embroidery. This entry was posted in Announcements, New Designs and tagged Remembrance Day. Bookmark the permalink. I just wanted to let you know that the Veterans of Foreign Wars raise money by selling paper poppies. I never knew of this connection before. And, I was in France 3 years ago, and yes, that was quite a sight. Sorry, I forgot to mention that it is the US Veterans of Foreign Wars.